While its not in the best condition I was still pleased when it came in. MIL-STD-1750A was first developed in 1980 to provide a uniform architecture for military computing, while allowing competition in the market to produce different versions at a hoped for reduced cost. By 1996 though the 1750A was declared inactive for new designs in the US military. It had been widely replaced by other more powerful commercial designs, notably the 80386 and 80486. Many militaries around the world continue to use the 1750A and the US Military continues to need spares. 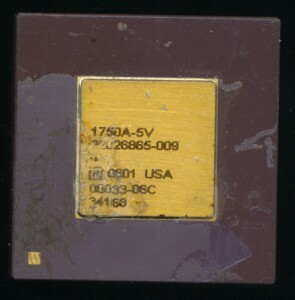 Honeywell continues to produce the 1750A-5V, a single chip implementation of the 1750A with on-board 40-bit FPU, much like Fairchild’s commercial F9450. Produced on a CMOS SOI (SIlicon On Insulator) 0.65u process the 1750A-5V runs at up to 40MHz, twice as fast as most did in the 1980’s. This particular example was produced in 2008 though Honeywell continues to make and advertise the 1750A. The radiation hardened version was used on the Cassini Orbiter (now orbiting Saturn), ESA’s Rosetta Comet probe as well as the Guidance computer for the Air Force’s Titan 4 missile. What was the price tag for this specific piece? New? Depends on quantity. I Salvaged it from scrap though.